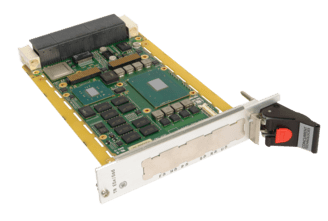 June 2017 – Concurrent Technologies, a leading supplier of processor solutions for demanding environments, is now shipping deployment quantities of the rugged conduction-cooled TR E5x/msd-RCx processor board having passed all the prerequisite qualification tests. These include storage and operation over extreme temperature ranges, as well as reliable operation when subjected to three-axis shock and random vibration tests according to the VITA 47 standard. As such, TR E5x/msd-RCx is available for use in the type of harsh environments encountered in some military, defense, transportation and industrial applications. 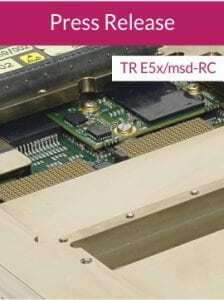 TR E5x/msd-RCx is a 3U VPX board based on a quad-core device from the Intel® Xeon® processor E3-1500 v5 family and has 16GB of DDR4 ECC DRAM. This allows for high performance command, control, communicate and compute, intelligence, surveillance and reconnaissance applications. 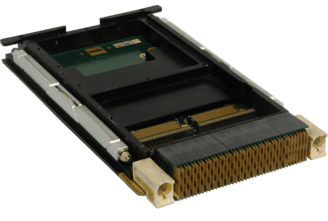 In addition to a wide assortment of on-board I/O interfaces, an XMC expansion site enables customers to add application specific storage and I/O with up to 24 single-ended and 20 differential pairs traced through to the backplane. Complimentary products are available from Concurrent Technologies including a Gen 3 PCI Express® switch, XMC carriers and mass storage boards, as well as software and firmware to help system integrators create class leading solutions.